Check out this preview for a new “Prime Time” Freddy Krueger release from NECA Toys. 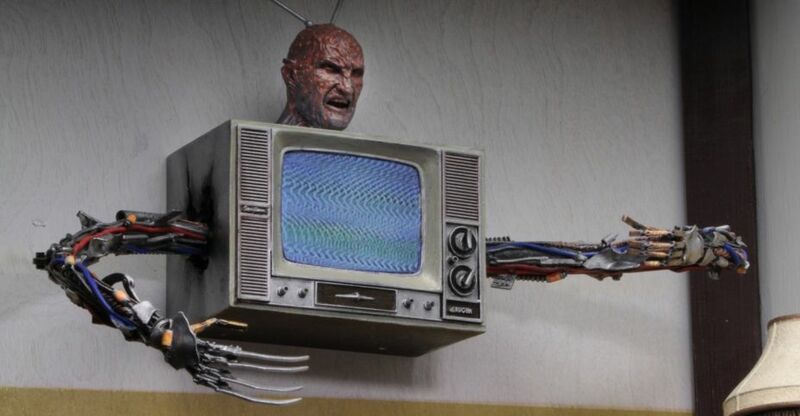 The preview shows the TV Freddy Krueger from A Nightmare On Elm Street 3: Dream Warriors. Sounds like this is part of an accessory pack. They said on Twitter it includes “one large item, one medium, and 2 smaller items.” We’ll update with photos and details once they become available. Click the banner for the full preview. Official info will be released Monday. NECA's Twitter profile picture is the snake/worm Freddy right now so I guess that'll also be in the pack. 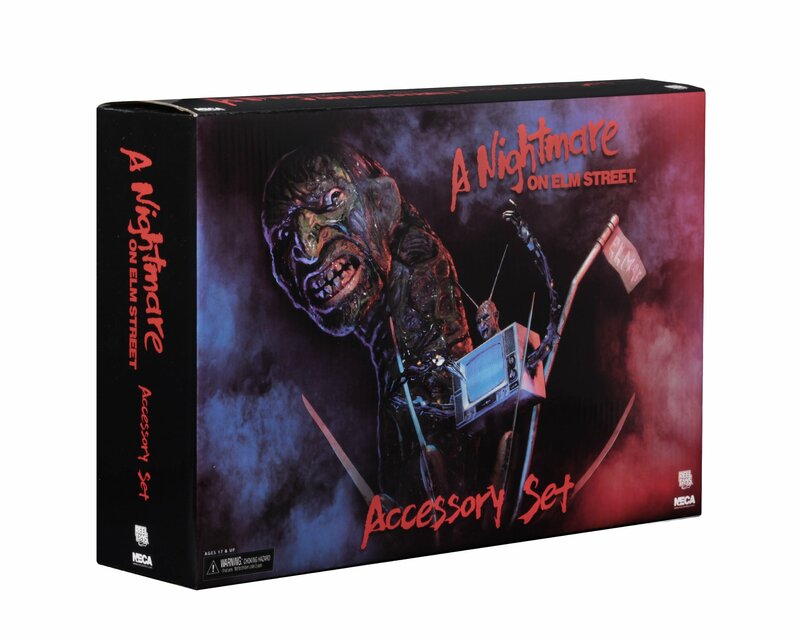 If anybody (preferably in North America) is planning on getting this set and doesn't want the "nightmare" Elm Street sign, please let me know. Omg, they did the worm! I need the worm. 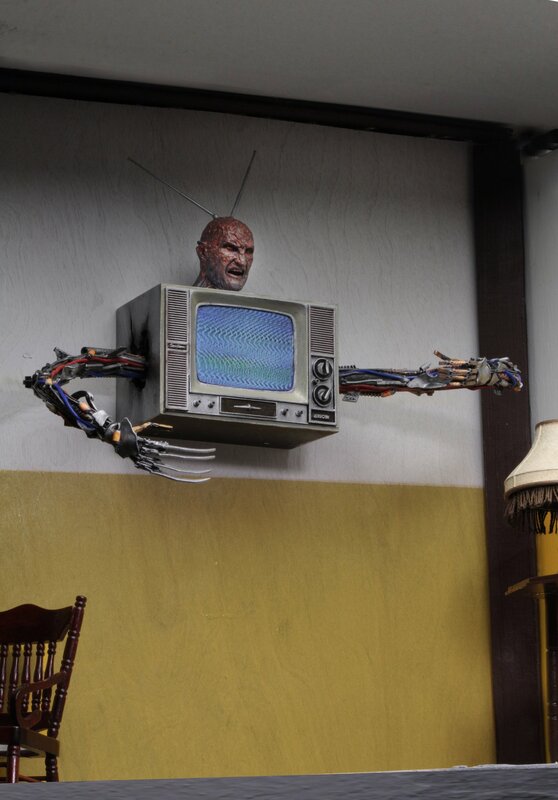 Awesome display piece. Pass, but only because I'm not a NOES fan. Otherwise, cool. Keep that to yourself, sicko. Why, oh why did I not see that coming? I only wish they some how articulated the freddy worm so it could move around like he did in the movie. A giant bendy wire body or articulated segments could have worked. An articulated jaw would also have been nice. I know there would be no way to make it in such a way that he could eat half a figure, but an articulated jaw would gave upped the cool factor on this. Maybe if there is enough demand they'll make a rubber/ soft plastic freddy worm much like they did with the baby Otachi that could achieve the movement he had in the film. The rest of the set looks pretty nice. I!definitely plan on picking it up. That's awesome. Thought I was done with Freddy, guess not. I do wish there were a couple of articulation points in the snake. Purdy good artwork. They say anything about price? Online retailers have it between $52 and $55. The Friday the 13th accessory set is way cheaper ($25-$30, tops) and comes with much cooler stuff, IMO. 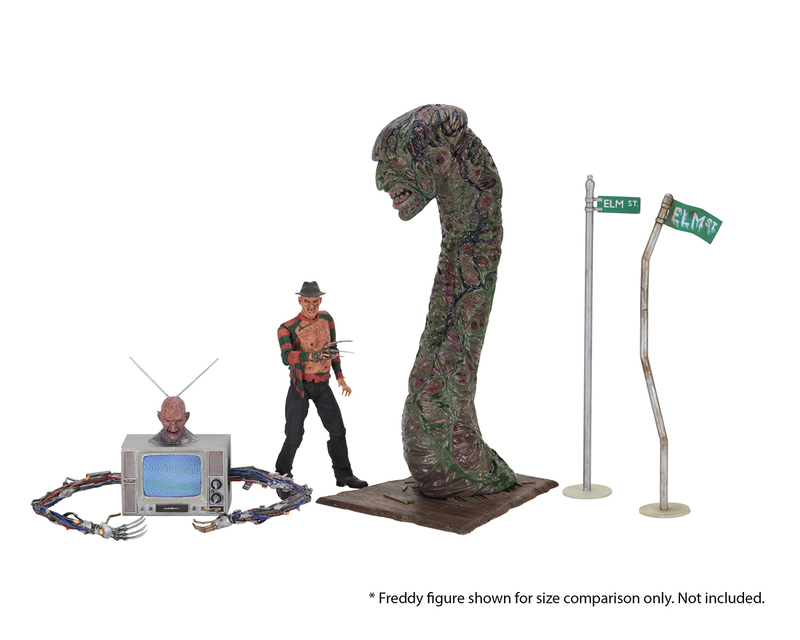 Yeah, but this one has 2 all new Freddys ... kind of, I wouldn�t buy a single packed worm Freddy, but if you threw in tv freddy and they did it as a double set I�d byte at 25, so I don�t think the price is all that shocking on this. I think Worm and TV Freddy only really work if they have a human victim to menace, and it's not like NECA is making figures of Nancy or anyone. At least the F13 set came with all legit dio pieces. Are they going to reissue the F13 set so they can sell it at Target? Randy has said of the survivors from Elm Street, Nancy is the only one they would like to make. But her likeness rights weren't included in the film, and they've been unsuccessful in the few attempts to explore an agreement. I guess Heather Langenkamp thinks she's still worth big bucks for some reason? Either that or she's just not interested, I guess. Um...er...why do you have a figure clad only in black electrical tape?